If you're talking Delhi, let's talk paranthas! Apart from all the lip-smacking delicacies that you've heard of, the Paranthas in Delhi stand out and loud! That is what makes this place a vacation destination for the gastronomic geeks and all food lovers! From plain veg. paranthas to ones with exotic fillings & from non-veg. paranthas with egg to all the meat possible, stuffed in one parantha, Delhi has it all! If you're in Delhi and looking to chow down on some large and stuffed rotis a.k.a. 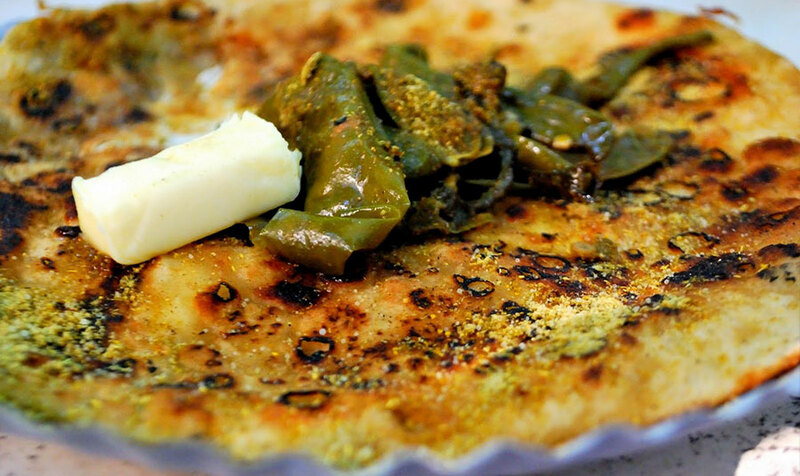 the paranthas, here are the 6 best places you could visit to satisfy all your hunger pangs. The infrastructure of the place whose origin traces back to the 1600's, is just the start of how traditional the experience of eating something like paranthas in a place like this can get. Out of all age-old establishments that exist here, the Pandit Gayanand Shiv Charan is the one that steals your attention. The one reason I knew of this place before I fell in love with its paranthas, was the fact that during the post-Independence era, our Prime Minister Jawaharlal Nehru was here to have a meal of paranthas! Also, this place has paranthas that don't have your regular onions or garlic, but have exotic fillings like kaju, badam, matar, etc which is quite the change of pace. The one problem I faced here was the fact that the place is not exactly easy to locate unless you specifically ask people about it. It's hidden in this tuck, behind the Kalyan Jewellers in Pitampura. If you're a parantha lover, this place should definitely be on your list of must visit parantha places in Delhi. Although it hasn't been hyped as much as other paranthawalas, the paranthas here still pack a punch of some great taste and flavor. The Raita with the garama garam paranthas are any foodie's dream! Forget everything you know about stuffed paranthas at any restaurant you have had before. This one-storied little joint is sure to blow your minds away with their perfectly cooked, and delicious tasting paranthas. These paranthas are stuffed till their max and dipped in a great amount of butter that you will be licking it off your fingers even long after you manage to finish their paranthas. The size of these paranthas is quite intimidating or tempting, depending on how hungry you are. Either way, you'd see people who aren't locals sharing a paranthas between two, sometimes even three people. The dal makhani is the cherry on top with these lip-smacking paranthas. One of the most famous paranthawalas in the National Capital, you cannot go through Delhi without being suggested this place as your next meal. The different thing about these paranthas is that they add egg to the paranthas, which is rarely available, at least with this kind of a balance of flavor and taste. You can make it spicier if you'd like, with the delicious chilly garnish they offer. If you're planning on having a meal that is light on your pocket when you're in Delhi, this place is the answer to your hunger calls. This is the perfect place to have a meal if you're in Delhi and you're missing your ma ke haath ka bana hua khana. The options in terms of Vegetarian and Non-Vegetarian paranthas are the first obstacles that come between you and a sumptuous meal. After you have finally decided what to eat, you need to ration specific amount of place for each food time. The Dal Makhani is to die for. The Raita tastes like one you've never had before. The food here will make you speechless. If you're not shy of chomping down on some meat while others around you do the same, then this is your place to be, in Delhi. The veg paranthas with butter dropping on every bite you take and the non-veg paranthas where the meat is so soft and well cooked, that it literally melts in your mouth. Karim Mia's, is what the shop is affectionately known as by the locals and everyone who has eaten here. The service here has a very homely feel and the food is out of this world. Head to it if you're in Delhi and can't wait to get your hands on some delicious Biryani or Kormas too.